Most individual U.S. states collect a state income tax in addition to federal income tax. The two are separate entities. Some local governments also impose an income tax, often based on state income tax calculations. Forty-three states and many localities in the United States may impose an income tax on individuals. Forty-seven states and many localities impose a tax on the income of corporations. State income tax is imposed at a fixed or graduated rate on taxable income of individuals, corporations, and certain estates and trusts. The rates vary by state. Taxable income conforms closely to federal taxable income in most states, with limited modifications. The states are prohibited from taxing income from federal bonds or other obligations. Most do not tax Social Security benefits or interest income from obligations of that state. Several states require different useful lives and methods be used by businesses in computing the deduction for depreciation. Many states allow a standard deduction or some form of itemized deductions. States allow a variety of tax credits in computing tax. State income tax is allowed as a deduction in computing federal income tax, subject to limitations for individuals. Most states provide for modification of both business and non-business deductions. All states taxing business income allow deduction for most business expenses. Many require that depreciation deductions be computed in manners different from at least some of those permitted for federal income tax purposes. For example, many states do not allow the additional first year depreciation deduction. Most states tax capital gain and dividend income in the same manner as other investment income. In this respect, individuals and corporations not resident in the state generally are not required to pay any income tax to that state with respect to such income. Some states have alternative measures of tax. These include analogs to the federal Alternative Minimum Tax in 14 states, as well as measures for corporations not based on income, such as capital stock taxes imposed by many states. Income tax is self assessed, and individual and corporate taxpayers in all states imposing an income tax must file tax returns in each year their income exceeds certain amounts determined by each state. Returns are also required by partnerships doing business in the state. Many states require that a copy of the federal income tax return be attached to at least some types of state income tax returns. The time for filing returns varies by state and type of return, but for individuals in many states is the same (typically April 15) as the federal deadline. Every state, including those with no income tax, has a state taxing authority with power to examine (audit) and adjust returns filed with it. Most tax authorities have appeals procedures for audits, and all states permit taxpayers to go to court in disputes with the tax authorities. Procedures and deadlines vary widely by state. All states have a statute of limitations prohibiting the state from adjusting taxes beyond a certain period following filing returns. All states have tax collection mechanisms. States with an income tax require employers to withhold state income tax on wages earned within the state. Some states have other withholding mechanisms, particularly with respect to partnerships. Most states require taxpayers to make quarterly payments of tax not expected to be satisfied by withholding tax. All states impose penalties for failing to file required tax returns and/or pay tax when due. In addition, all states impose interest charges on late payments of tax, and generally also on additional taxes due upon adjustment by the taxing authority. 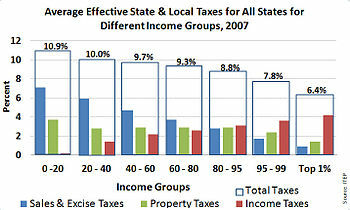 The average effective state and local taxes for all states for different income groups. Sales taxes and excise taxes (blue), property taxes (green), state income taxes (red), and total taxes (clear). Forty-three states impose a tax on the income of individuals, sometimes referred to as personal income tax. State income tax rates vary widely from state to state. The states imposing an income tax on individuals tax all taxable income (as defined in the state) of residents. Such residents are allowed a credit for taxes paid to other states. Most states tax income of nonresidents earned within the state. Such income includes wages for services within the state as well as income from a business with operations in the state. Where income is from multiple sources, formulary apportionment may be required for nonresidents. Generally, wages are apportioned based on the ratio days worked in the state to total days worked. In addition, some states allow cities and/or counties to impose income taxes. For example, most Ohio cities and towns impose an income tax on individuals and corporations. By contrast, in New York, only New York City and Yonkers impose a municipal income tax. 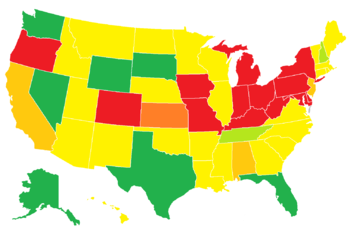 States with no state individual income tax are in red; states taxing only dividend and interest income are in yellow. Alaska – no individual tax but has a state corporate income tax. Like New Hampshire, Alaska has no state sales tax, but unlike New Hampshire, Alaska allows local governments to collect their own sales taxes. Alaska has an annual Permanent Fund Dividend, derived from oil revenues, for all citizens living in Alaska after one calendar year, except for some convicted of criminal offenses. Florida – no individual income tax but has a 5.5% corporate income tax. The state once had a tax on "intangible personal property" held on the first day of the year (stocks, bonds, mutual funds, money market funds, etc. ), but it was abolished at the start of 2007. Nevada – has no individual or corporate income tax. Nevada gets most of its revenue from sales taxes and the gambling and mining industries. Tennessee has a "Hall income tax", levied at a rate of 3% on income received from stocks and bonds not taxed ad valorem as of 2019. The tax is 2% as of 2020, 1% as of 2021, and fully repealed as of 2022. In 1932, the Tennessee Supreme Court struck down a broad-based individual income tax that had passed the General Assembly, in the case of Evans v. McCabe. However, a number of Attorneys General have recently opined that, if properly worded, a state income tax would be found constitutional by today's court, due to a 1971 constitutional amendment. Texas – no individual income tax, but imposes a franchise tax on corporations. In May 2007, the legislature modified the franchise tax by enacting a modified gross margin tax on certain businesses (sole proprietorships and some partnerships were automatically exempt; corporations with receipts below a certain level were also exempt as were corporations whose tax liability was also below a specified amount), which was amended in 2009 to increase the exemption level. The Texas Constitution places severe restrictions on passage of an individual income tax and the use of its proceeds. Washington – no individual tax but has a business and occupation tax (B&O) on gross receipts, applied to "almost all businesses located or doing business in Washington." It varies from 0.138% to 1.9% depending on the type of industry. Wyoming has no individual or corporate income taxes. South Dakota – no individual income tax but has a state corporate income tax on financial institutions. New Hampshire – has an Interest and Dividends Tax of 5%, and a Business Profits Tax of 8.5%. A Gambling Winnings Tax of 10% went into effect July 1, 2009 and was repealed May 11, 2011. New Hampshire has no sales tax. 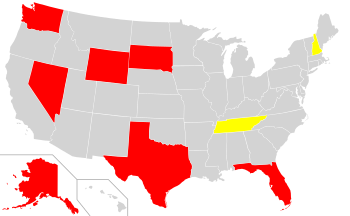 States with state-level individual income tax but no local-level individual income taxes are in yellow. The following states have local income taxes. These are generally imposed at a flat rate and tend to apply to a limited set of income items. Most municipalities, including Columbus, Cleveland, and Cincinnati (earned income and rental income; some municipalities require all residents over a certain age to file, while others require residents to file only if municipal income tax is not withheld by employer; reported on tax form issued by municipal income tax collector, currently CCA and RITA, or collecting municipalities, such as Columbus and Cincinnati, which sometimes also collect for neighboring towns and villages). Most states impose a tax on income of corporations having sufficient connection ("nexus") with the state. Such taxes apply to U.S. and foreign corporations, and are not subject to tax treaties. Such tax is generally based on business income of the corporation apportioned to the state plus nonbusiness income only of resident corporations. Most state corporate income taxes are imposed at a flat rate and have a minimum amount of tax. Business taxable income in most states is defined, at least in part, by reference to federal taxable income. 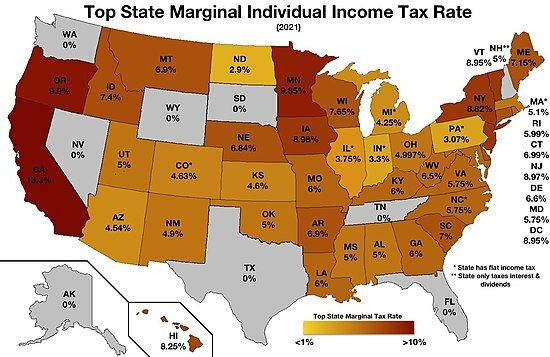 According to www.taxfoundation.org these states have no state corporate income tax as of Feb 1, 2010: Nevada, Washington, Wyoming, Texas, and South Dakota. However, Texas has a franchise tax based on "taxable margin", generally defined as sales less either cost of goods sold less compensation, with complete exemption (no tax owed) for less than $1MM in annual earnings and gradually increasing to a maximum tax of 1% based on net revenue, where net revenue can be calculated in the most advantageous of four different ways. There must be a fair relationship to services provided. Substantial nexus (referred to generally as simply "nexus") is a general U.S. Constitutional requirement that is subject to interpretation, generally by the state's comptroller or tax office, and often in administrative "letter rulings". In Quill Corp. v. North Dakota  the Supreme Court of the United States confirmed the holding of National Bellas Hess v. Illinois  that a corporation or other tax entity must maintain a physical presence in the state (such as physical property, employees, officers) for the state to be able to require it to collect sales or use tax. The Supreme Court's physical presence requirement in Quill is likely limited to sales and use tax nexus, but the Court specifically stated that it was silent with respect to all other types of taxes  ("Although we have not, in our review of other types of taxes, articulated the same physical-presence requirement that Bellas Hess established for sales and use taxes, that silence does not imply repudiation of the Bellas Hess rule."). Whether Quill applies to corporate income and similar taxes is a point of contention between states and taxpayers. The "substantial nexus" requirement of Complete Auto, supra, has been applied to corporate income tax by numerous state supreme courts. The courts have held that the requirement for fair apportionment may be met by apportioning between jurisdictions all business income of a corporation based on a formula using the particular corporation's details. Many states use a three factor formula, averaging the ratios of property, payroll, and sales within the state to that overall. Some states weight the formula. Some states use a single factor formula based on sales. Some states tax resident corporations on nonbusiness income regardless of apportionment. Generally, a resident corporation is one incorporated in that state. The definition of nonbusiness income varies but generally includes investment income of business corporations, including dividends. Some states require and some states permit parent/subsidiary controlled groups of corporations to file returns on a consolidated or combined basis. California and Illinois require that all U.S. members of a "unitary" group must file a combined return. State corporate income tax returns vary highly in complexity from two pages to more than 20 pages. States often require that a copy of the federal income tax return be attached to the state return. Corporate income tax return due dates may differ from individual tax return due dates. Most states grant extensions of time to file corporate tax returns. Some of the English colonies in North America taxed property (mostly farmland at that time) according to its assessed produce, rather than, as now, according to assessed resale value. Some of these colonies also taxed "faculties" of making income in ways other than farming, assessed by the same people who assessed property. These taxes taken together can be considered a sort of income tax. The records of no colony covered by Rabushka (the colonies that became part of the United States) separated the property and faculty components, and most records indicate amounts levied rather than collected, so much is unknown about the effectiveness of these taxes, up to and including whether the faculty part was actually collected at all. and the Delaware Colony in the Province of Pennsylvania, from 1752 to the Revolution. Rabushka makes it clear that Massachusetts and Connecticut actually levied these taxes regularly, while for the other colonies such levies happened much less often; South Carolina levied no direct taxes from 1704 through 1713, for example. Becker, however, sees faculty taxes as routine parts of several colonies' finances, including Pennsylvania. During and after the American Revolution, although property taxes were evolving toward the modern resale-value model, several states continued to collect faculty taxes. and Pennsylvania from 1782 to 1840 (when it was replaced by an individual income tax; Becker, as noted above, would date this tax earlier). Between the enactment of the Constitution and 1840, no new general taxes on income appeared. In 1796, Delaware abolished its faculty tax, and in 1819 Connecticut followed suit. On the other hand, in 1835, Pennsylvania instituted a tax on bank dividends, paid by withholding, which by about 1900 produced half its total revenue. and North Carolina from 1849 to 1921 (when it was replaced by a modern individual income tax). The 1850s brought another few income tax abolitions: Maryland and Vermont in 1850, and Florida in 1855. During the American Civil War and Reconstruction Era, when both the United States of America (1861-1871) and the Confederate States of America (1863-1865) instituted income taxes, so did several states. and Kentucky from 1867 to 1872. As with the national taxes, these were made in various ways to produce substantial revenue, for the first time in the history of American income taxation. On the other hand, as soon as the war ended, a wave of abolitions began: Missouri in 1865, Georgia in 1866, South Carolina in 1868, Pennsylvania and Texas in 1871, and Kentucky in 1872. The rest of the century balanced new taxes with abolitions: Delaware levied a tax on several classes of income in 1869, then abolished it in 1871; Tennessee instituted a tax on dividends and bond interest in 1883, but Kinsman reports that by 1903 it had produced zero actual revenue; Alabama abolished its income tax in 1884; South Carolina instituted a new one in 1897 (eventually abolished in 1918); and Louisiana abolished its income tax in 1899. Missouri, individual and corporate, from 1917. However, other states, some perhaps spurred by Populism, some certainly by Progressivism, instituted taxes incorporating various measures long used in Europe, but considerably less common in America, such as withholding, corporate income taxation (as against earlier taxes on corporate capital), and especially the defining feature of a "modern" income tax, central administration by bureaucrats rather than local elected officials. The twin revenue-raising successes of Wisconsin's 1911 and the United States' 1914 income taxes prompted imitation. Note that writers on the subject sometimes distinguish between corporate "net income" taxes, which are straightforward corporate income taxes, and corporate "franchise" taxes, which are taxes levied on corporations for doing business in a state, sometimes based on net income. Many states' constitutions were interpreted as barring direct income taxation, and franchise taxes were seen as legal ways to evade these bars. The term "franchise tax" has nothing to do with the voting franchise, and franchise taxes only apply to individuals insofar as they do business. Note that some states actually levy both corporate net income taxes and corporate franchise taxes based on net income. For the following list see  and. Virginia, modernisation of existing corporate and individual taxes, from 1926. The U.S. Virgin Islands, from 1922. District of Columbia, individual and either corporate or franchise, from 1939. A "mirror" tax is a tax in a U.S. dependency in which the dependency adopts wholesale the U.S. federal income tax code, revising it by substituting the dependency's name for "United States" everywhere, and vice versa. The effect is that residents pay the equivalent of the federal income tax to the dependency, rather than to the U.S. government. Although mirroring formally came to an end with the Tax Reform Act of 1986, it remains the law as seen by the U.S. for Guam and the Northern Mariana Islands because conditions to its termination have not yet been met. In any event, the other mirror tax dependencies (the U.S. Virgin Islands and American Samoa) are free to continue mirroring if, and as much as, they wish. The U.S. acquired one more dependency from Japan in World War II: the Trust Territory of the Pacific Islands. The Trust Territory of the Pacific Islands, individual and corporate, from 1971. In the early 1970s, Pennsylvania and Ohio competed for businesses with Ohio wooing industries with a reduced corporate income tax but Pennsylvania warning that Ohio had higher municipal taxes that included taxes on inventories, machinery and equipment. Alaska abolished its individual income tax retroactive to 1979 in 1980. The only subsequent individual income tax instituted to date is Connecticut's, from 1991, replacing the earlier intangibles tax. The median family income in many of the state's suburbs was nearly twice that of families living in urban areas. Governor Lowell Weicker's administration imposed a personal income tax to address the inequities of the sales tax system, and implemented a program to modify state funding formulas so that urban communities received a larger share. Numerous states with income taxes have considered measures to abolish those taxes since the Late-2000s recession began, and several states without income taxes have considered measures to institute them, but only one such proposal has been enacted: Michigan replaced its more recent value-added tax with a new corporate income tax in 2009. The corporate income tax rate is 6.5%. Alaska does not have an individual income tax. The corporate income tax rate is 4.9%. The standard corporate rate is 8.84%, except for banks and other financial institutions, whose rate is 10.84%. Colorado has a flat rate of 4.63% for both individuals and corporations. Connecticut's corporate income tax rate is 7.5%. Delaware's corporate income tax rate is 8.7%. ^ States with no individual income tax are Alaska, Florida, Nevada, New Hampshire, South Dakota, Texas and Wyoming. States with no corporate income tax are Nevada, South Dakota, and Wyoming. For tables of information on state taxes, see, e.g., 2009 State Tax Handbook, CCH, ISBN 9780808019213 (hereafter "CCH") or later editions, or All States Handbook, 2010 Edition, RIA Thomson, ISBN 978-0-7811-0415-9 ("RIA") or later editions. ^ Exceptions are Arkansas, Iowa, Mississippi, New Hampshire (interest and dividends only), New Jersey, Pennsylvania, and Tennessee (interest and dividends only, to be reduced for tax year 2016, with potential further reductions and elimination by 2022), none of which use federal taxable income as a starting point in computing state taxable income. Colorado adjusts federal taxable income only for state income tax, interest on federal obligations, a limited subtraction for pensions, payments to the state college tuition fund, charitable contributions for those claiming the standard deduction, and a few other items of limited applicability. See 2010 Colorado individual income tax booklet Archived 2010-12-25 at the Wayback Machine. ^ "States That Allow You to Deduct Federal Income Taxes"
^ "Publications". Ohio Department of Taxation. Archived from the original on 21 June 2013. Retrieved 5 June 2013. Since 1975, the department has published a Brief Summary of Major State & Local Taxes in Ohio, designed to be a quick overview of all of the state's significant state and local taxes. ^ "FL Dept Rev - Florida's Corporate Income Tax". Dor.myflorida.com. 2013-01-01. Archived from the original on 2013-05-18. Retrieved 2013-06-09. ^ "FL Dept Rev - 2007 Tax Information Publication #07C02-01". Dor.myflorida.com. Archived from the original on 2013-05-23. Retrieved 2013-06-09. ^ Bankrate.com. "Nevada". Bankrate.com. Archived from the original on 2013-06-02. Retrieved 2013-06-09. ^ Tenn. Const. art. II, §28. ^ Locker, Richard (2016-05-20). "Gov. Bill Haslam signs Hall income tax cut, repeal into law". The Tennessean. Retrieved 2016-12-10. ^ "SB 0047". Tennessee General Assembly. Archived from the original on 2016-12-12. Retrieved 2016-12-10. ^ See Tenn. AG Op #99-217, Paul G. Summers - "Archived copy" (PDF). Archived from the original (PDF) on 2009-06-23. Retrieved 2009-07-18. CS1 maint: Archived copy as title (link). ^ "Wyoming Department of Revenue". revenue.state.wy.us. Archived from the original on 19 October 2012. Retrieved 1 May 2018. ^ "New Hampshire HB229 - 2017 - Regular Session". e-lobbyist.com. Archived from the original on 18 November 2011. Retrieved 1 May 2018. ^ "Frequently Asked Questions - NH Department of Revenue Administration". www.revenue.nh.gov. Archived from the original on 18 October 2016. Retrieved 1 May 2018. ^ "State Individual Income Taxes" (PDF). taxadmin.org. Archived (PDF) from the original on 28 December 2016. Retrieved 1 May 2018. ^ Indiana Growth Model Archived 2017-02-24 at the Wayback Machine. Wall Street Journal (2016-07-20). Retrieved on 2016-08-09. ^ "USA Income Tax Rates 2016 Federal and State Tax". www.scopulus.co.uk. Archived from the original on 1 May 2018. Retrieved 1 May 2018. ^ Massachusetts taxes certain types of gains at a flat 12%; a subset of those allow a 50% deduction, producing an effective rate of 6%. These tiers are still considered flat, since they are based on the type of income, and not the amount. See Individual Income Tax Provisions in the States Archived 2009-11-04 at the Wayback Machine. ^ "What cities impose an income tax?". Michigan.gov. 2013-02-21. Archived from the original on 2013-05-26. Retrieved 2013-06-09. ^ "Municipal Statistics". Pennsylvania Department of Community and Economic Development. Archived from the original on 2016-03-31. Retrieved 2016-03-29. ^ Accounts, Texas Comptroller of Public. "Franchise Tax". www.window.state.tx.us. Archived from the original on 10 April 2015. Retrieved 1 May 2018. ^ See, e.g., Tax Commissioner of the State of West Virginia v. MBNA America Bank, 220 W. Va. 163, 640 S.E.2d 226, 231 (2006), cert. denied, 551 U.S. 1141. ^ See, e.g., the discussion in Hellerstein, Hellerstein & Youngman, State and Local Taxation, Chapter 8 section C. ISBN 0-314-15376-4. ^ For a compilation of formulas, see State Tax Handbook published annually by CCH. ^ Seligman, Edwin R.A. (1914). The Income Tax: A Study of the History, Theory, and Practice of Income Taxation at Home and Abroad. Second edition, revised and enlarged with a new chapter. New York: The Macmillan Company. Underlies most of the history section through 1911, although several examples of sloppiness are recorded below, but for the faculty taxes and Seligman's evaluation of them as income taxes, see Part II Chapter I, pp. 367-387. ^ Comstock, Alzada (1921). State Taxation of Personal Incomes. Volume CI, Number 1, or Whole Number 229, of Studies in History, Economics and Public Law edited by the Faculty of Political Science of Columbia University. New York: Columbia University. On the Panic of 1837 see p. 14. ^ Kinsman, p. 102; the date 1860 reported by Seligman, p. 413, is clearly a typo, since the two writers use the same reference, the Texas Laws of 1863, chapter 33, section 3. ^ Kinsman, p. 100; Seligman, p. 413, says 1864, but the common reference, the Louisiana Laws of 1864 act 55 section 3, is in fact to Laws of 1864-1865, and this law was enacted in April 1865. ^ State Taxation of Interstate Commerce. Report of the Special Subcommittee on State Taxation of Interstate Commerce of the Committee on the Judiciary, House of Representatives. Pursuant to Public Law 86-272, as Amended. 88th Congress, 2d Session, House Report No. 1480, volume 1. (Usually abbreviated House Report 88-1480.) Often referred to as the "Willis committee report" after chair Edwin E. Willis. See p. 99. ^ a b National Industrial Conference Board, Inc. (1930). State Income Taxes. Volume I. Historical Development. New York. ^ Stark, John O. (1987-1988). "The Establishment of Wisconsin's Income Tax". Wisconsin Magazine of History Archived 2006-11-30 at the Wayback Machine volume 71 pp. 27-45. ^ Foster, Roger (1915). A Treatise on the Federal Income Tax under the Act of 1913. Second edition. Rochester, N.Y.: The Lawyers Co-operative Publishing Co. Pp. 889-894. ^ Legislative Interim Tax Study Committee (1958). Development of State Income Taxes in the United States and Oregon. Salem, OR. Pp. 21-22. ^ Rowe, L[eo] S. (1904). The United States and Porto Rico. New York: Longmans, Green, and Co., but seen as New York: Arno Press, 1975, ISBN 0-405-06235-4. Pp. 188-190. ^ Tantuico, Sr., Francisco, and Francisco Tantuico, Jr. (1961). Rules and Rulings on the Philippine Income Tax. Tacloban: The Leyte Publishing Corp. Pp. 3-5. ^ Clark, Victor S., et alii (1930). Porto Rico and Its Problems. Washington: The Brookings Institution. P. 200. ^ Chyatte, Scott G. (1988). "Taxation through the Looking Glass: The Mirror Theory and the Income Tax System of the U.S. Virgin Islands before and after the Tax Reform Act of 1986". Pp. 170-205 of Volume 6, Issue 1 of Berkeley Journal of International Law Archived 2013-11-13 at the Wayback Machine. Pp. 173-176. ^ Blakey, Roy G., and Violet Johnson (1942). State Income Taxes. New York: Commerce Clearing House. List pp.3-4. ^ a b Penniman, Clara, and Walter W. Heller (1959). State Income Tax Administration. Chicago: Public Administration Service. Chart pp. 7-8. ^ a b c d Penniman, Clara (1980). State Income Taxation. Baltimore and London: The Johns Hopkins University Press. ISBN 0-8018-2290-4. Chart pp. 2-3. ^ Legislative Interim Tax Study Committee, pp. 24-28. ^ a b Washington State Research Council (1964). A State Income Tax: pro & con. Pp. 6-7. ^ Joint Committee on Taxation (2012). Federal Tax Law and Issues Related to the United States Territories. JCX-41-12. Pp. 8, 20, and 22. ^ Leiserowitz, Bruce (1983). "Coordination of Taxation between the United States and Guam". Pp. 218-229 of Volume 1, Issue 1 of Berkeley Journal of International Law Archived 2013-11-13 at the Wayback Machine. Pp. 219-222. ^ Legislative Interim Tax Study Committee, pp. 35-36. ^ Department of the Treasury (1979). Territorial Income Tax Systems: Income Taxation in the Virgin Islands, Guam, the Northern Mariana Islands and American Samoa. Washington. P. 28. ^ Department of the Treasury 1979 pp. 26-27. ^ Joint Committee on Taxation 2012 p. 22. ^ Tax Division, Department of Revenue, State of Alaska (2012). Annual Report Fiscal Year 2012. "Archived copy". Archived from the original on 2013-09-22. Retrieved 2013-11-23. CS1 maint: Archived copy as title (link), accessed 22nd November 2013. P. 84. ^ "Connecticut - History". City-data.com. Archived from the original on 2013-05-12. Retrieved 2013-06-09. ^ "Frequently Asked Questions Alabama Individual Income Tax". 2015. Archived from the original on 22 December 2015. Retrieved 13 December 2015. ^ "Frequently Asked Questions Corporate Income Tax". Alabama Department of Revenue. 9 April 2015. Archived from the original on 22 December 2015. Retrieved 13 December 2015. ^ "Personal Income". Alaska Department of Revenue - Tax Division. Alaska Department of Revenue - Tax Division. 2010. Archived from the original on 2015-12-22. Retrieved 2015-12-17. ^ "Section 43-1011. Taxes and tax rates". Arizona Revised Statutes. Phoenix: Arizona Legislature. Archived from the original on 22 December 2015. Retrieved 17 December 2015. ^ "Section 43-1111. Tax rates for corporations". Arizona Revised Statutes. Phoenix: Arizona Legislature. Archived from the original on 22 December 2015. Retrieved 17 December 2015. ^ "Section 26-51-201. Individuals, trusts, and estates.". Arkansas Code of 1987 Annotated Official Edition. Little Rock: Arkansas General Assembly. Archived from the original on 12 December 2015. Retrieved 17 December 2015. ^ "Section 26-51-205. Corporations -- Work Force 2000 Development Fund.". Arkansas Code of 1987 Annotated Official Edition. Little Rock: Arkansas General Assembly. Archived from the original on 12 December 2015. Retrieved 17 December 2015. ^ a b "2018 California Withholding Schedules - Method B (DE 44)" (PDF). California Franchise Tax Board. 2018. Retrieved 2018-05-08. ^ "Colorado". Tax Foundation. Tax Foundation. Archived from the original on 22 December 2015. Retrieved 18 December 2015. ^ "Title 12: Chapter 208 - Corporation Business Tax". General Statutes of Connecticut. Hartford: Connecticut General Assembly. 2015. Archived from the original on 22 December 2015. Retrieved 18 December 2015. ^ "State Individual Income Tax Rates and Brackets for 2016". TaxFoundation.org. 2016. Archived from the original on February 23, 2017. Retrieved February 16, 2017. ^ "State Corporate Income Tax Rates and Brackets for 2016". TaxFoundation.org. 2016. Archived from the original on February 16, 2017. Retrieved February 16, 2017. ^ "State Individual Income Tax Rates and Brackets for 2016 - Tax Foundation". taxfoundation.org. 8 February 2016. Archived from the original on 28 March 2018. Retrieved 1 May 2018. ^ "State Corporate Income Tax Rates and Brackets for 2017 - Tax Foundation". taxfoundation.org. 27 February 2017. Archived from the original on 8 February 2018. Retrieved 1 May 2018.